If you are planning to sell a home in Las Vegas, it is important to get a home inspection and appraisal before putting your home on the market. There are a number of reasons for this, all of which will benefit you. Las Vegas home values have gone up while the real estate market has continued to be a great buyer’s and seller’s market. This gives sellers a great opportunity to cash in on this great real estate opportunity. But you need to get a Las Vegas home inspection and Las Vegas appraisal before listing. One of the best reasons to get your Las Vegas appraisal and inspection before listing your home is that people don’t like surprises. How many people have purchased a home only to discover that it was infested with termites or other problems? Then the new home owners were forced to call in an inspector after the fact. They may resent having to do this and it takes money and time for them to have to deal with this. Getting a home inspection and appraisal saves the buyer from having to do it themselves, and this is a strong selling point for your home when you list it. Another significant reason to do a pre-home inspection and home appraisal is the fact that it will lead to higher offers. As explained above, it becomes a strong selling point. The buyer knows it has been recently inspected for termites, repairs, and problems. This also makes you more honest as a seller (in the mind of the buyer) because you will have a report for them regarding the findings of the inspection and appraisal. This gives them a sense that they are getting exactly what you say you are selling, and they do not feel you can be dishonest in such circumstances. This often leads to higher offers due to the fact that buyers believe what you are saying more since there is an appraiser’s signature to back it up. Just as doing a pre-home inspection and appraisal leads to higher offers, it can also often lead to MORE offers. As word spreads that you have had the home inspected, repaired, and appraised, it will increase the number of people who are interested in your home. This is why you will want to place this in a prominent location in your ad once you have had this process completed, so that people will know that you have taken the extra steps to ensure that your home is up to par before listing it. This will also lead people to trust you more and that leads to more offers too. The most important step in a home sale (or any kind of sale) is the close. You can present your home in the best light possible, tell them how wonderful it is, have your Las Vegas real estate agent show them pictures which accentuate the best features of the house, and connect with the buyer. But, if they don’t complete the sale, it is wasted time. Offering a home which has been pre-inspected, repaired, and appraised with an official Las Vegas appraisal company goes a long way toward convincing them that you are offering an excellent home for sale, and that you are someone who can be trusted. And this leads to more sales. Many sales are lost in the last minute, not because the buyer did not like the home, but because the seller or real estate agent did not convince them that you were telling the truth about the house. Or there is some looming problem about some of the fixtures, the carpet, under the floor, or some other discreet area of the home which is not as obvious to the eye. Many home buyers believe that sellers sometimes cover up the problems, and only show the best aspects of the house. Getting a pre-home inspection and appraisal takes this doubt away from potential buyers, so that they focus on closing the deal. It’s just good basic sales practices: you are answering the lingering questions buyers have by presenting them with the proof that your house is all you say it is. 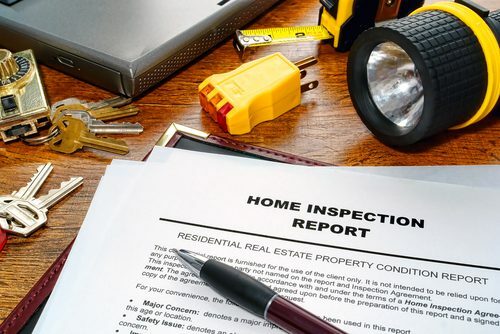 WHAT HAPPENS IN A HOME INSPECTION AND APPRAISAL PROCESS? As you can see, this is a vast list of areas that the inspection covers, so buyers will know when they see the results of this that your home has been thoroughly checked out and that no stone has been left unturned. This goes a long way toward building credibility for your home and yourself and getting the buyer to trust you. Also, if they have any questions regarding the inspection, they can go straight to the Las Vegas home inspection team who did the inspection and ask any questions they might have. Documentation of the entire condition of the property, both inside and out. The typical home appraiser has a state license or certification in home appraisal processes from an accredited school or real estate training. This means that they are highly qualified to make an assessment of the final market value of the house. This figure is highly influential to the buyer in communicating how much the home is worth and in determining how much they are willing to pay. It is important to note here that an appraiser is NOT an inspector. For this reason, he or she cannot do structural assessments, termite checks, under the floor evaluations, or any of the other things the home inspection team can do. This is why it is important to have both a pre-home inspection and a pre-home appraisal completed prior to listing your house for sale. Keep in mind that it is the whole picture that completes this process in the mind of the buyer: both the inspection and the appraisal are important. The appraisal gives them a number of the market value according to a certified appraiser, and the home inspection ensures the buyer that the home has been checked out from the inside out and meets up to standards. Both of these pieces of the puzzle are important as you prepare to put your home on the market. These two together, along with a record of whatever repairs or additions you have done, will add greatly to the value of your home and increase the likelihood of closing the sale with buyers in the final analysis. Las Vegas home values may fluctuate and the market is unpredictable but getting your home both inspected, repaired, and appraised (in that order) will greatly increase its value both in the minds of buyers as well as on the open market. Taking these extra steps ahead of time, before you prepare to list your property could be the one factor in the amount of money you get for your home, the number of offers you get, and the final selling price. In addition, if you decide to get into real estate investing sometime in the future, it gets you into a series of good business habits which will ensure that your selling experience will be a successful one. Nothing is guaranteed, but getting your home inspected and appraised puts you head and shoulders above the crowd in terms of presenting your home and yourself with the highest standards and allowing potential buyers to feel that they are getting a straightforward approach to your real estate offerings. If we can help advise you on your real estate listings, see The Ballen Group in Las Vegas. We have years of experience with real estate transactions and we know the market in the Las Vegas area.